This morning, I'm headed to Europe for a holiday with dear friends from Germany. We'll spend a bit of time in Duetschland and Switzerland (plus a stop in Lake Como, Italy to visit my pal George Clooney), but most of our vacation will be spent soaking up the sun on an island in the French Riviera. Well, everyone else will be soaking up the sun...this fair-skinned redhead will be slathered in SPF 70 and wearing a big hat. Not that I'm complaining - I've been looking forward to this trip for months, and I love wearing big hats! The last time I was in France, I was 22 years old and backpacking around Europe on my own. After getting hopelessly lost in Paris and leaving in tears without even visiting the Eiffel Tower, I left my passport, traveler's checks, Eurail Pass and camera on a train in Monaco (thankfully, they were retrieved by another backpacker and returned to me, for which I'll be forever grateful). This time around, I'm looking forward to sleeping in real hotels rather than youth hostels, and traveling with companions who know exactly where we're going! 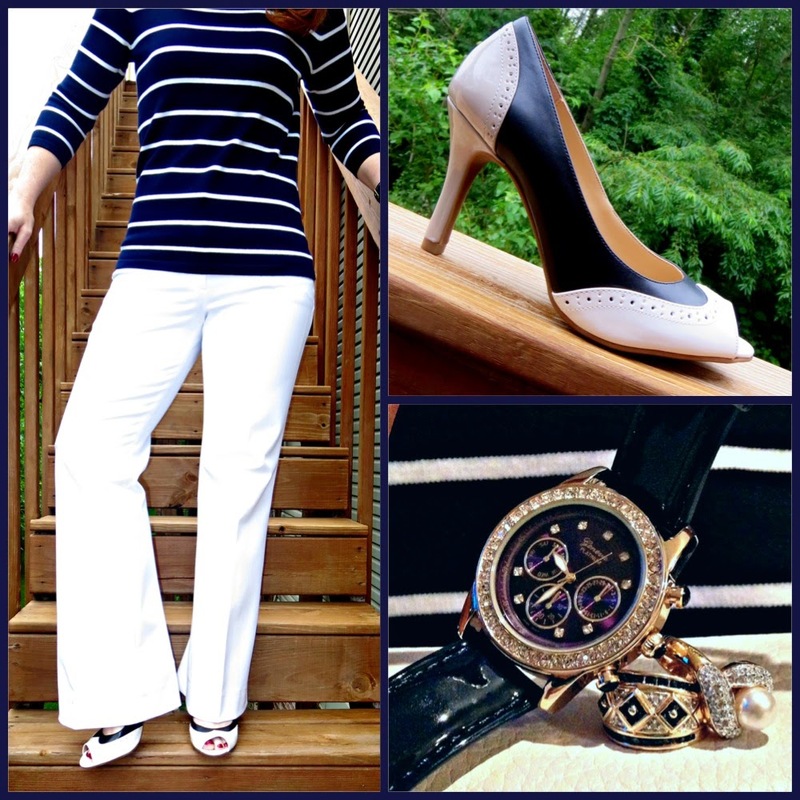 In anticipation of spending time in the Cote d'Azur, it was only fitting that I channeled the spirit of the French Navy last week with an iconic nautical look. My Breton striped Ralph Lauren sweater may seem as American as apple pie, but it's actually a historical nod to the French Navy's adoption of striped uniforms in 1858. Coco Chanel introduced the design to the fashion world in 1917 after a visit to the French coast inspired her nautical runway collection. Adopted by affluent Europeans in the 30s; beatniks in the 50s and 60s; and featured in countless films, the style has an enduring quality that's never out of fashion. It has also been popularized by iconic figures like Marilyn Monroe, Pable Picasso, Bridgette Bardot, Andy Warhol, Jean Seberg, Audrey Hepburn, and James Dean (click on the links to see how they wore the look). Intrigued by the history of these stripes? You can read more about it here!